Anyone who’s used a SATA or EIDE hard drive for storing their data knows that rotational hard drives are one of the loudest components in modern computers. This is because even miniaturized versions have a spinning platter that is used to store information, even when the computer is off. This platter makes a ruckus during its rotation, which is why a solid state drive, which has no moving parts, is whisper silent. In addition to this, a solid state drive with its lack of moving parts will have a longer operational life than a rotational unit. 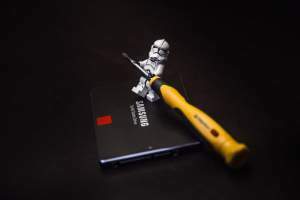 Think of it this way, a moving platter has components that will wear down with use, whereas a solid state drive uses flash memory for data storage, which means that the components have a much lesser chance of going off track or simply breaking down. Solid-state drives are inherently smaller devices because of their lack of a spinning platter. When you are in the market for a new laptop, which I am sure you are, you want a device with a portable form factor, otherwise, why buy a laptop at all? This means that solid-state drives are the perfect laptop hard drives because they can come in very small sizes, which reduces the overall size of the device. This is the primary reason that people keep their operating systems, video games, and frequently used programs on their solid-state drives and keeps their media files and seldom used files on an HDD. Simply put, solid-state leaves traditional hard drives in the dust when it comes to the time it takes to access files. To put it into perspective, a traditional hard drive can take 5,000 to 10,000 microseconds to access a piece of data. A solid-state drive can take about 35 to 100 microseconds to access the same piece of data. Amazingly fast, right? This speed is why programs that need a lot of file access like operating systems are best put on SSD. When you’re using an HDD, it takes time for this rotational drive to speed up to an operational speed, so where Windows 10 might take four to five minutes to boot up on an HDD; on an SSD, it can boot up in seconds. The best laptops can perform like a desktop AND last for at least eight hours without being plugged in. For this degree of performance, a laptop should have the most efficient components like an efficient processor, graphics processor, and a solid-state drive. SSDs draw less power than a traditional HDD because of the lack of a motor for the platter, so they are perfect for efficiency in a laptop. The best laptops with SSD that have the most space are going to set you back by quite a bit. This is because per gigabyte, solid-state drives are much more expensive than the tried and true technology of the HDD. This is definitely coming down, but the process is definitely a gradual one. Fortunately, there are plans in place that will see much more parity between the prices of rotational and solid-state drives. Many high-end laptops use a combination of both SSD and HDD technology to provide both speed and higher storage capacities. It’s not uncommon for a machine that’s excellent for video editors to have a setup that incorporates a half terabyte of solid state storage and another two terabytes of standard rotational storage. This way, the overall laptop can stay in a reasonable price range but still have a speedy operation and high capacity. If you’re planning on investing in one of these types of laptops (I’ve included two in the review section), then check out this guide on PC world so that you can optimize your performance. I find that when I want to play World of Warcraft, it loads MUCH faster when I store it on my solid-state drive. The same can be said with most demanding games and software. If you’re into video editing, then a larger SSD may benefit you. This is because as your files encrypt, access time becomes a major consideration as this will hasten the overall process. Store your media files on your solid state, and you’ll be able to manipulate them much faster than you would on your mechanical hard drive. Despite the higher cost per gigabyte of solid-state drives, many of the cheaper budget laptops incorporate this technology in order to make the laptop smaller and more portable. The ASUS VivoBook F556UA-AB54 is a great machine that only costs about $500, which is a drop in the bucket when you consider its solid features. First, it has an i5-7200U, which is a dual-core processor with a base clock speed of 2.50GHz. This is a fairly decent processor for a laptop at this price point. Additionally, this machine has 8 GB of RAM, which is plenty for most casual applications. I really love the fact that this machine is so whisper-quiet and functional. It doesn’t have the best battery life in the world- at only six hours, but once again, for most people, this is pretty good. With an Intel HD 520 graphics card under the hood, don’t expect insane gaming performance with this model, but it should be able to play some older games without too much stuttering and frame rate loss. Another great budgetary machine, the Asus Zenbook UX360CA is still very impressive compared to some more expensive laptops that are on the market. For this price range, you’d never expect this laptop’s display to be touchscreen. In addition to this, the display has an exceptional contrast and brightness that will amaze you months after your purchase. For better or for worse, this laptop is completely fan-less, which means that you may want to purchase a cooling pad for it. Without fans, this is a nearly silent laptop that also has a fairly decent processor in the dual-core M3-6Y30 CPU from Intel. This processor performs fairly well but doesn’t have a lot of computational power when compared to quad-core i5s or i7s. With such a good display, this is a great media viewing machine, though I wouldn’t use it for gaming due to its weaker processor and lack of an independent GPU. Now we’re getting into the big leagues! While I wouldn’t go nuts with the games on the HP Envy 15t due to its lack of a Nvidia or AMD chipset, this is a great laptop for just about anything else. This is also one of those combination SSD and HDD units that I mentioned before. The HP Envy 15t has a 500 GB PCIe solid state drive and a one terabyte HDD for storage. One of its most impressive features is its 4k touchscreen, which makes this a great unit for watching some Netflix or playing one of those fairly beautiful but not demanding indie games that are available on Steam. If you really would like to game, the Dell Inspiron 17559 is a very similar machine with more processing and gaming chops. 4K.com, which specializes in everything UHD, has a great review of that machine on their page. Another high-performance laptop, the Dell XPS 15 gives you two choices when it comes to its graphics performance; a Nvidia GTX 960M that has 2GB in VRAM or a Nvidia Pascal GTX 1050 with 4GB of VRAM. This is a great range of selection for gamers, and the device also has a great 4k display of the in-plane switching (IPS) variety that also is a touchscreen. This display also has some great overall brightness and contrast. Dell seems to want to give you as many options as possible with this laptop as it also has two CPUs to choose from as well. The potential processors are the i7-6700HQ and the more powerful i7-7700HQ; both of these are quad core and fairly powerful for most applications. The chief drawback of this laptop is its middling battery life; expect a little more than six hours on a charge. For your hard drive, you’ll get about a half terabyte of solid state storage, which should be excellent for most users. Here we are at the cream of the crop. This laptop provides a good amount of storage for the majority of user-types. First, you get a 1 TB SSD. Solid-state drives at over a terabyte are still somewhat rare, and its presence on this laptop really illustrates its premium design. In addition to this, the MSI GS63VR STEALTH PRO also has two terabytes of storage on a separate HHD, which is a great place to store your media and files. For performance, this laptop has a Nvidia Pascal GTX 1060, which is virtual reality-ready. It also has an i7-7700HQ under its hood that has quad core functionality and a processor base frequency of 2.80 GHz. The display is 4K, which is perfect for gaming and media viewing, and it also has 16 GB of RAM for quick access speeds. To me, the biggest weakness of this laptop is its noise. With an HDD and several internal fans, this laptop makes a bit of a racket, but if you’re thinking of this for storage and game compatibility, then these aren’t deal breakers. With the advent of the SSD, laptops are becoming smaller and quicker. All of the laptops that I’ve covered here are excellent machines for just about any user. If you have any questions about which is the best laptops with SSD for you, then place your questions in the comments. I’ll be sure to get back to you quickly. I am a senior citizen starting a new career in real estate and have not sold a home yet. I use a HP mini and the screen is too small. I would like a touch screen with SSD and looking for a good choice in th $500 to $700 price range.